The Jenn-Air Products Company, simply known as Jenn-Air, was founded in 1947 by Louis Jenn. In the early stages of the company, Jenn-Air primarily manufactured industrial fans. Eventually focus turned to other appliances and lead to the invention of the first ever self-ventilated downdraft range. Jenn-Air carries a large line of luxury products for the home and aims to create inspired designs for each line of products. Even inspiration can have flaws and when your Jenn-Air appliance breaks or needs maintenance, call Action Appliance Repair. Since 1961, our family-owned and operated business has been committed to customer service. Time and time again our customers return for expert service and reliable technicians. We know just how big of an inconvenience a broken appliance can be. It completely disrupts your everyday life. At Action Appliance Repair we have more than 50 years of experience working with luxury appliances such as Jenn-Air. You can trust Action Appliance Repair to get your appliance up and running like new again. When your Jenn-Air product is in need of repair or maintenance of any kind then call us toll free at 866-611-4479. 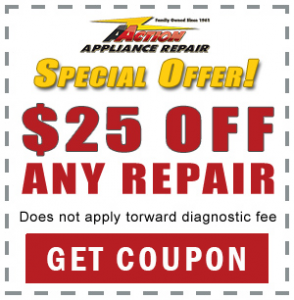 Action Appliance Repair gives you the best service and price in town. Even your service call is free with each repair we do. If your Jenn-Air appliance breaks down then make sure to call Action Appliance Repair for quality service you can depend on. We are experts in Jenn-Air appliance repair and our technicians are trusted to handle your machine with the utmost care. Aside from our trusted, knowledgeable staff, we also offer our customers a 5 year pro-rated parts warranty. So what does calling Action Appliance Repair for your Jenn-Air appliance mean for you? We waive the fee of our service call if we repair your Jenn-Air appliance. You won’t owe us anything if we visit and are able to repair your appliance.